Today and Tonight: Fall is finally here, and not a day too late! A cool start to the day will lead to the first day of below average temperatures of October, as highs reach near 80° under sunny skies. Winds will be breezy, as crisp, northerly winds suppress temperatures heading into this evening. 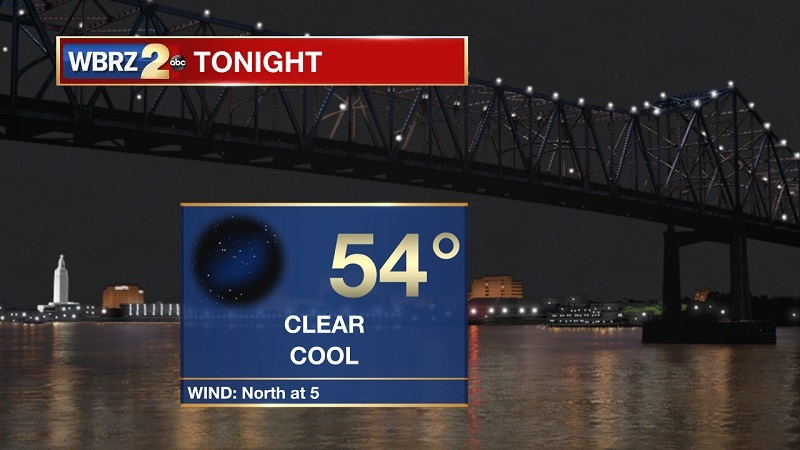 A chilly night ahead, as temperatures will cool into the 60s by 8 PM, with overnight lows reaching around 54° late tonight. Up Next: High pressure behind the cold front will keep skies sunny, and conditions cool through the weekend. Warmer and wetter conditions return on Monday, but only briefly. Tropical Storm Michael still ravishing the southeast, and is continuing to weaken over Eastern Georgia. 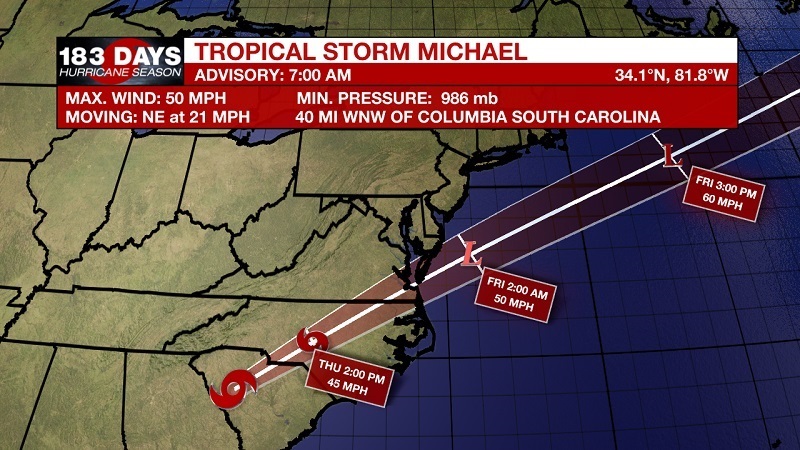 Currently, Michael is located about 40 miles west-northwest of Columbia, South Carolina. Sustained winds are now 50 mph, and it is moving toward the northeast at 21 mph. This motion is expected to continue with an increase in forward speed through tonight. A turn toward the east-northeast and an even faster forward speed are expected on Friday. On the forecast track, the center of Michael will move through eastern Georgia into central South Carolina this morning, then moves across portions of central and eastern North Carolina and southeastern Virginia into the Atlantic Ocean by late tonight or early Friday. Some additional weakening is expected today while the center remains over land. However, Michael is forecast to intensify as it becomes a post-tropical low over the Atlantic late tonight or early Friday. 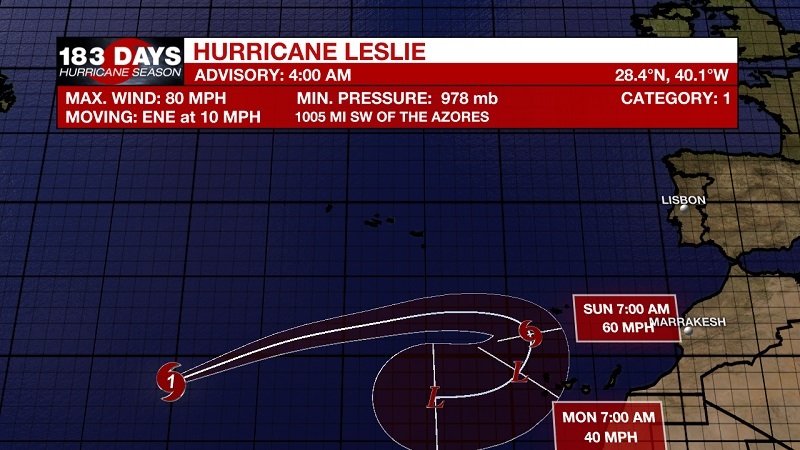 Hurricane Leslie is expected to remain a hurricane for a couple of days. Currently located about 1,005 miles southwest of the Azores with 80 mph sustained winds and moving east-northeast at 10 mph. This general motion with some increase in forward speed is expected during the next couple of days. A slower southeastward motion is forecast to begin by late Saturday. Little change in strength is forecast during the next 48 hours, but weakening is expected over the weekend. 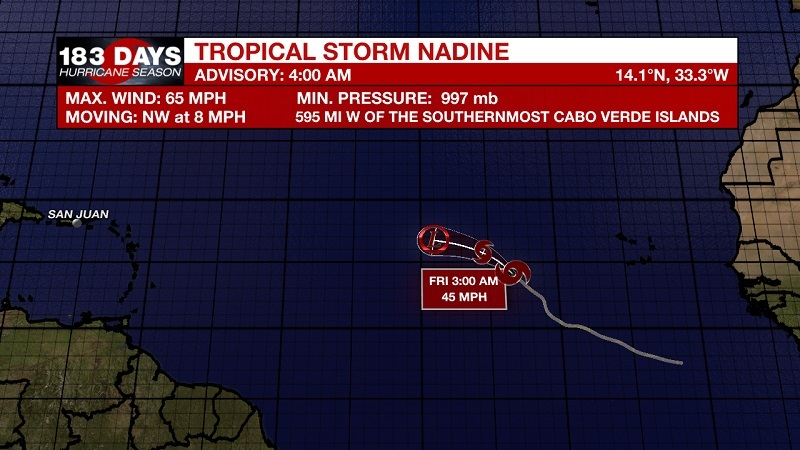 Tropical Storm Nadine is forecast to weaken soon. Currently located about 595 miles west of the Cabo Verde Islands with sustained winds of 65 mph, and moving northwest at 8 mph. This general motion is anticipated to continue during the next day or so. 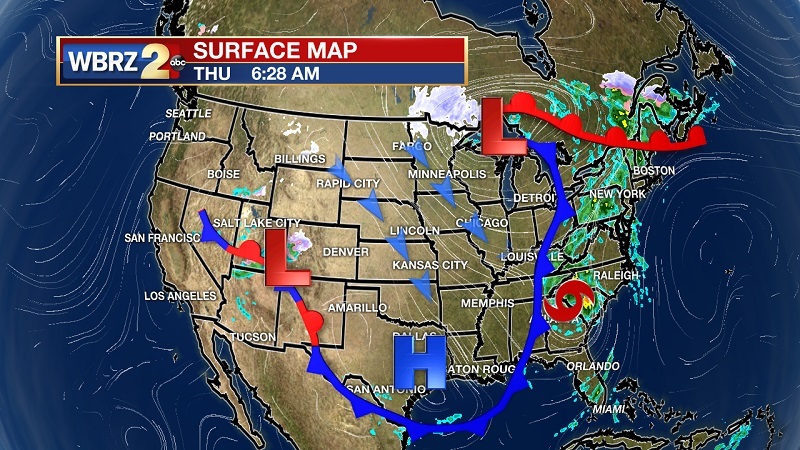 A turn toward the west-northwest or west is forecast to occur on Friday. Gradual weakening is expected during the next couple of days, and Nadine is forecast to degenerate into a trough of low pressure over the weekend. We are also keeping our eye on a broad area of low pressure, which is expected to develop over the west-central Caribbean Sea in a day or two. Environmental conditions are expected to support some slow development, and a tropical depression could form late this weekend or early next week while the system moves slowly westward across the northwestern Caribbean Sea toward Central America. 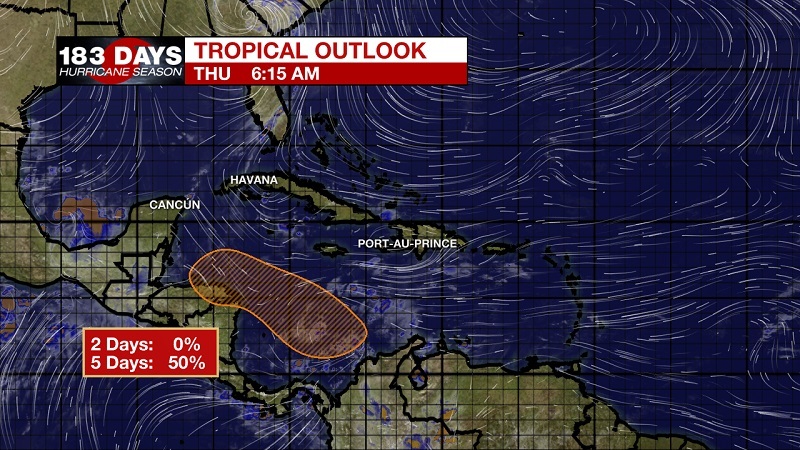 The National Hurricane Center is forecasting a 50% chance of tropical development within the next 5 days. We are reaping the benefits of the first intact cold front of the season. Temperatures this morning in the mid-60s, and highs will be barely breaking into the 80s this afternoon. Tonight’s low will drop into the 50s, but conditions will be warming up as we proceed into the weekend. Things will stay dry until Monday, which is when a cold front will allow for afternoon showers and isolated storms to return into the region. 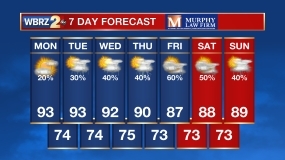 Temperatures will also briefly increase into the mid-80s on Sunday, but highs will plummet back down into the mid to upper 70s behind the front on Tuesday and Wednesday.